Life is more like life in Pest. In my district there are butchers. Actual butchers. Like the kind of butchers there used to be in old Akron who would sell Hungarian sausage at Christmas and Easter. They have the meats for the day–from boneless skinless chicken breast to cow’s brains, and a very small refrigerated section, mostly with selections of cabbages and pickled cucumbers. 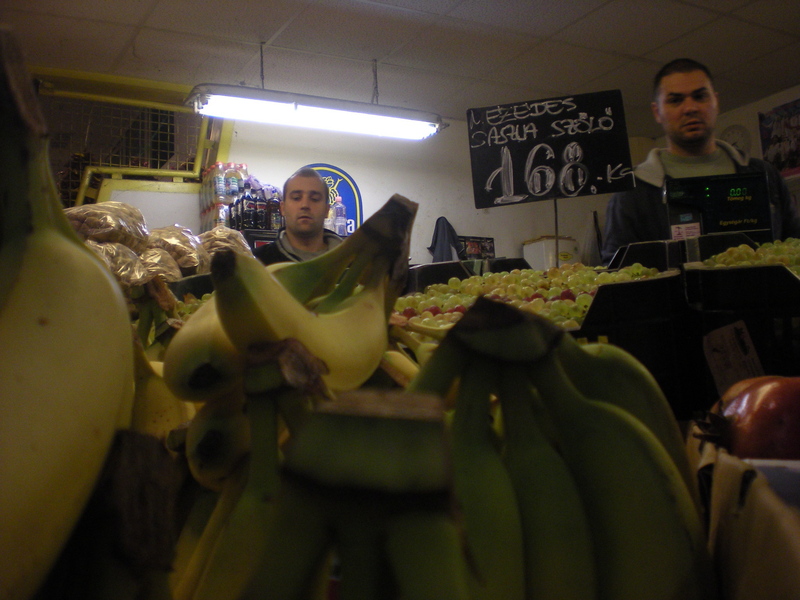 There are countless fruit and vegetable shops, which are about as big as an early 20 hipster’s NYC apartment. And the Lehel market. Fruits, meats, farm chicken, fish. And on the upper level, just about everything you can imagine. A specialist who can sharpen your knife. A button guy. A store devoted entirely for that hard-to-find-shoelace you simply can’t match since losing it in the laundry last month. It’s just the way things go. Workers, students, young professionals. Cafes, antique bookstores, government workers. People are riding the metro here, getting tickets, buying a new suit. Someone is buying geraniums. Life is more like life here. And because I started five new classes at Nokia this week, and have been under the weather, and have still been moving things in, I haven’t had time for words of any kind, let alone strung together in some little honey-special way. No poems either. So instead I’m going to just post some pictures. Some life is more like life here pictures, so you can see it too. Great pictures. They provide a profile of a vibrant, livable city. It reminds me in many ways of the Pittsburgh I remember as a child in the early 1950s. A city full of life. Probably it’s one reason why Americans in particular are drawn to these parts of European cities–because it reminds them of something that has been, for the most part, lost in American cities. 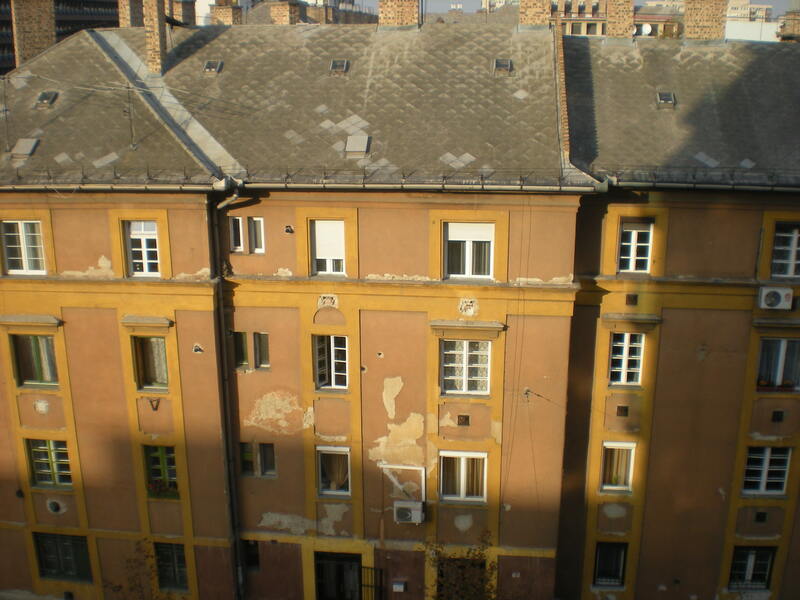 And probably, no matter how cosmopolitan and sophisticated a city gets, like Budapest for example, these places probably won’t ever go away because everyone really loves them, young and old. Nice pics, Jes. My mouth started watering at the pictures of the sausages and meats. When I come to visit, you can just drop me off here. 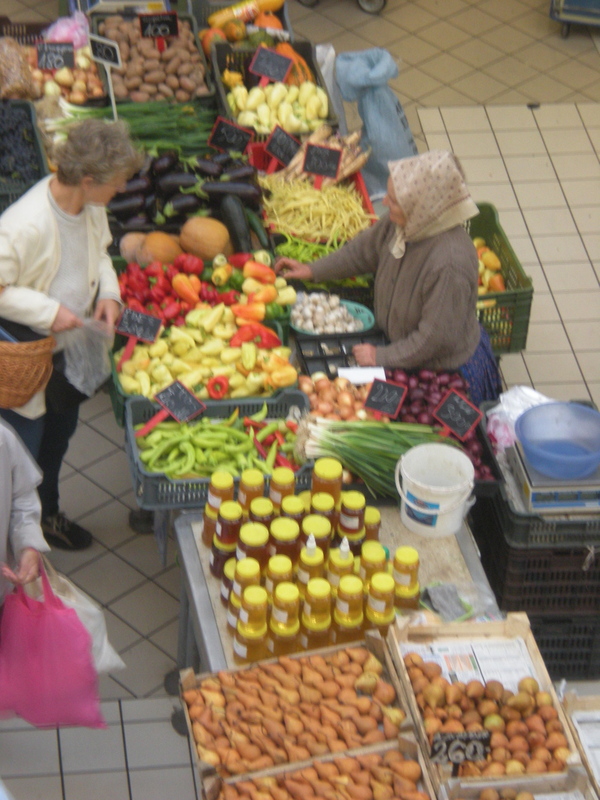 I would love to go to the market everyday and do my food shopping. Instead, I have the pleasure of going to a large impersonal grocery store. I really think we as a society need to move toward this type of shopping. Next summer I am going to support the local farmers by only buying my fruits & vegtables from them-at least I know it’s fresh and where it came from. Keep up the good work Jes! We miss you. (did you hear your Dad pickup up JJ & Grandpap and took them to Ohio for the weekend? They were really looking foward to it). Love You. That’s the thing about shopping. Especially now when the market price is so high for basic foods–not only is it good for the seller, it’s good for you to buy direct. I mean, I can go to the end of the street and buy some veggies and fruits and breads from a lady who got all of that stuff from her little garden and her oven, and then go to the other end of the street and get some meat from a local butcher. It’s almost necessary to cut out the “middle” man now in America. Plus, ultimately it’s healthy, without the kind of mega-farm chemicals, etc.